Blurb : ‘HIC SVNT DRACONES’: The original Latin text for ‘Here Be Dragons’ appears on medieval maps to mark unchartered territories, grave dangers and nameless evils – all the makings of one hell of a party. At twenty-four, the overeducated Ayaan has quit the monotony of his job and absconded to Rome to sort his muddled mind and get some peacetime … only to run into two old friends: Kwan, a Korean trying to escape a murky past, and Aiden, a rich, cavalier American with little more than whiskey and women on his mind. As the three misfits cavort through drug-addled frenzies, bar brawls, masquerades and fleeting romances, the stage is set for an epic adventure. But little do they realize that something sinister stalks their every move, pulling the strings of their journey – leading them to a shocking revelation about one of their own. If you liked The Hangover and Zindagi Na Milegi Dobara, you’ll love Here Be Dragons. 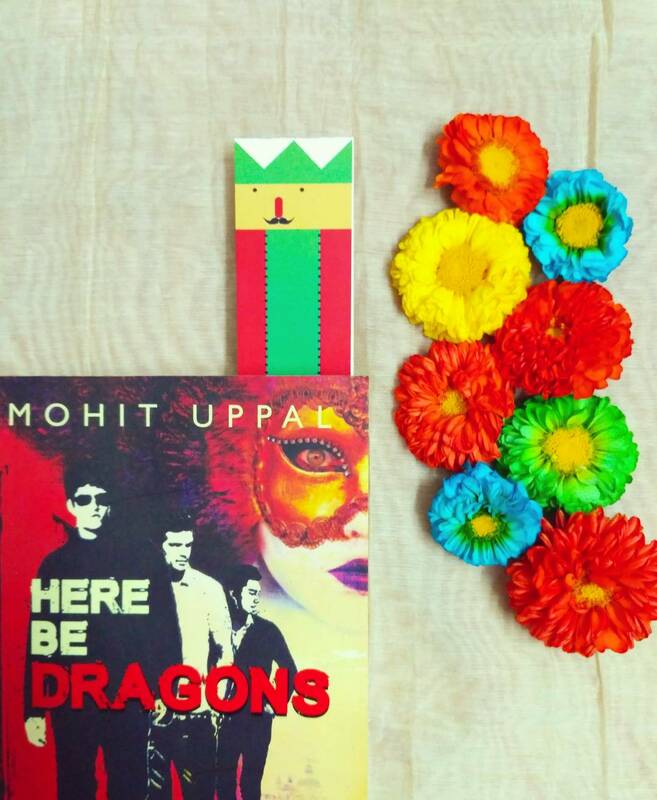 My view : A book that essentially entertains and has been written for that purpose only, Here Be Dragons by Mohit Uppal is one hell of a ride you don’t want to miss. Although on the same lines as that of Zindagi Na Milegi Dobara or The Hangover, the story still manages to intrigue the readers and captures their focus towards the plot. More than the plot of the book, it is the story telling capability of the author that mesmerizes throughout the pages. What starts off as a young gentleman’s journey of revival after a futile job life and equally depriving personal one, goes on to become an endless pursuit of another man’s eternal love. Ayaan is an average Indian youth, falling into the pitless gloom of a monotonous career. He decides to take a recreational vacation to Italy and find the missing element in his life. He stumbles upon his two long-lost friends and they begin their search for someone who is so well-hidden that it gets really dangerous while trying to unravel all secrets. Do they succeed in finding the same person is what the question remains. Aiden’s exuberance and larger than life persona is extremely addictive and the energy transforms through the pages. Kwan’s brooding and reserved self brought a sense of level-headedness amidst the sense of reckless adventures. Even though the characters were largely predictable and stereotyped, there was never a sense of boredom, such is the mastery of writing that the author possesses. The cinematic sequences and the oh-so-common situations are so brilliantly described that they don’t seem filmy at all. The humor is present throughout the book in subtle tones. The most awestruck element of the book is the picturesque description of Italy, Venice in particular. The wanderlusted soul in me felt like fleeing to Venice for a week. Here Be Dragons is a light, amusing read that is the perfect cure for those times when we have been plunged deep in a reading slump by a highly depressing book.